This expertly blended organic infusion is combined with apple to create a subtly sweet, fruity and refreshing infusion that is naturally caffeine-free and designed to support your wellbeing. 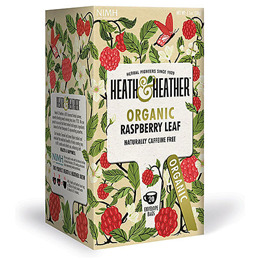 Organic Raspberry Leaves 30%, Organic Hibiscus, Organic Apple Pomace, Organic Sweet blackberry Leaves, Non Organic Raspberry Flavour (5%), Non Organic Tartaric Acid, Organic Raspberry Pomace, Organic Rosehips. Below are reviews of Heath & Heather Organic Raspberry Leaf - 20 Bags by bodykind customers. If you have tried this product we'd love to hear what you think so please leave a review.